I shared the room with Elsa. It was fun, we talked and talked and... what!? Suddenly it was 11 PM! We had to wake up early the following day in order to go to Pondok Tanggui's feeding site on time! 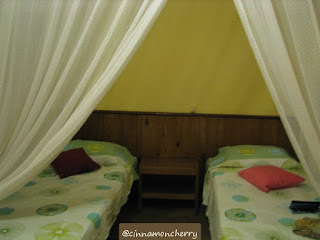 As you can see here, the beds are cute with anti-mosquito net. It has hot water but bear in mind that you will be sharing the water with other bathrooms nearby, so sometimes the hot water (even regular one) ran out. They use purified water from the river so the color is somewhat brownish. Elsa and I decided to use mineral water to brush our teeth. The breakfast is usually ready from 7 AM onwards but you can request it earlier. (In our case, around 6 AM) The souvenir shop is also open during that time. I bought a hat here. This hotel has walkways made of ironwood. Guests can walk around and observe the wild animals. There are some spots for birdwatching, alas, we had to leave so early so observing the birds was out of the question. Macaque monkeys and proboscis monkeys sometimes venture inside the rooms (so thrilling!) so guests are advised to close the door and the windows, especially at night. I am in a great anticipation to see the hat. Is it a cowboy type of hat or more like a bee-farmer's.. I enjoyed the stories, and eager to see Tom myself before his future heir predictably puts him down the throne. Regular type of hat. :) I shared the pic in the blog post concerning Pondok Tanggui.